In very broad terms, most of my bread baking is either traditional British, Italian or French, with the odd nod towards American ideas about things like sourdough, which normally all point back to Europe anyway. This misses out a whole school of baking centred around Germany, Eastern Europe and parts of Scandinavia that has rye flour at its heart. Rye is a different thing altogether, and it produces heavy, dense loaves that are substantial and rugged, the type of loaf that look as if it’d be useful on a building site once it goes stale. I’ve decided to investigate, and this is the first of a few bread related posts that include rye, this time in a Central European tradition of baking. reveals its roots lie in Poland and the Czech Republic. The similarities between this loaf and a rye sourdough I sometimes buy from the local and long-established Polish bakery are striking. This isn’t difficult baking – the methods should be familiar to anybody who’s baked bread before. The difference is simply in the ingredients. Start with a large bowl. Weigh 350g of strong white flour and 150g of rye flour into it. 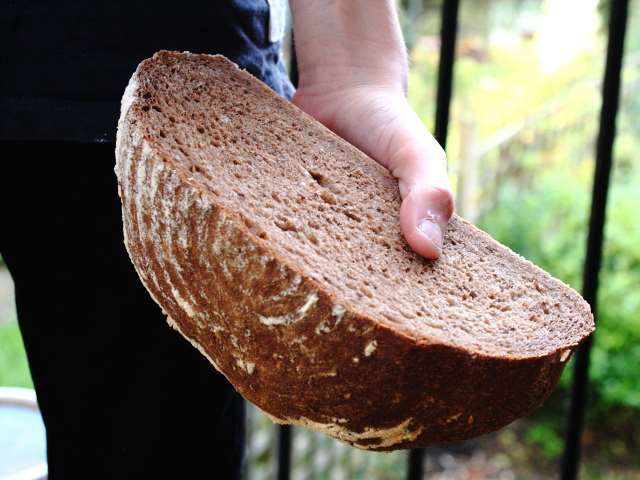 The proportions are important – rye is heavy and dense flour, and a loaf made entirely with it would be quite hard work. Add 10g of salt, 10g of sugar, 7g of instant yeast, 10ml of olive oil, 10g of molasses and 20g of caraway seeds. Now, the big decision. This loaf traditionally has a very dark crust, which is achieved by adding 15g of cocoa powder to the ingredients before mixing. There are pros and cons to this, and I’ve tried with and without. With, the loaf has a very slight chocolate aftertaste, which isn’t bad, but it’s definitely noticeable in the background. Without, the caraway punches through more strongly, and the crumb is much lighter. On balance, I prefer ‘without’. Try both methods and see – it’s entirely down to personal taste. Add 340ml of water to the dry ingredients and mix together to form a rough dough. Knead for up to fifteen minutes, either by hand or in a mixer, until the dough is smooth and stretchy. Cover the bowl with cling film and let the dough rise for an hour, then stretch the dough up and over itself a few times to deflate it very gently and to get the gluten working properly, cover, and leave for another half an hour. When the dough is proved, tip it onto a floured work surface and shape it into a ball, using your hand to tuck and cup underneath the dough so that the top stretches tight. Allow the dough to rest for fifteen minutes or so, then flatten the dough and repeat the process. This re-shaping helps to build the loaf’s internal structure and strength. or basket, so that the sides of the expanding loaf are supported. Use plenty of flour to dust the inside of the basket, so that the dough doesn’t stick. Gently lift the dough into the basket and let it prove for another hour, at which point it’ll be about three-quarters proved. Pre-heat the oven to 250c, and warm a heavy baking tray in it. Transfer the risen dough onto the baking tray by gently tipping the basket out and hoping that nothing sticks. Return the tray to the oven and spray water inside to create steam, shut the door and bake for twenty minutes, then turn the tray around and reduce the temperature to 200c and bake for another twenty minutes. Allow the loaf to cool completely before slicing. This makes the base of an incredible pork sandwich.